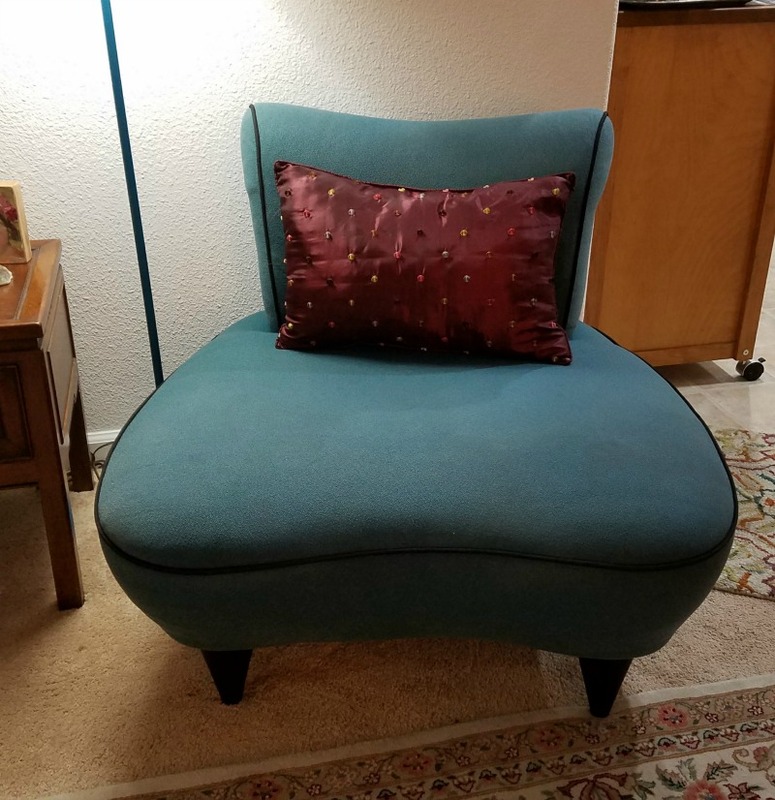 I have kind of been on the lookout to replace a little coral living room chair that has become quite tattered. Waiting for a chair to grab me in the gut and insist on going home with me. And today, it happened! Below you see my heavily stained new chair. Good ole St. Vincent's - my absolute favorite furniture store. I think at very least half my house is a St V's makeover. Well, this odd chair wiht it's fat bottom, and chubby tapered legs, piping and arched back....I found irresistable. When my friend came over, she thought it quite ghastly though her words were gentler than that. I laughed out loud. I guess I gravitate to the odd, peculiar, unique. It was quite dirty and stained and I thought I would end up reupholstering it. But I tried some stain remover on it and unbelievably it came out quite gorgeous. Then I sanded the legs down (3 were blonde wood, 1 was black) and painted with some black gesso. West Elm has some Retro Wing Chairs for about $450. Found some on ebay for up to $995! 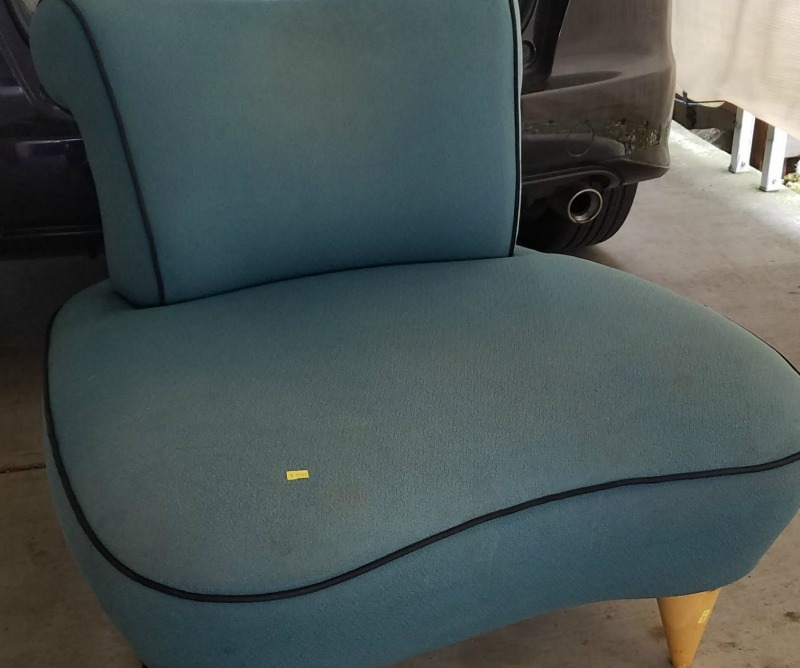 Here is my chair cleaned up beatifully after using FOLEX spot remover. I am sooooo loving this quirky chair!! This is a Mid Century Modern Kidney Chair, these were very popular in the late 60's early 80's. There would have been living rooms with this style chair, and couch to match plus the kidney shaped coffee tables. If it is not marked with a makers name there is no way to know who made it but, it can be valued if you like? No it does not cost you more for the value. This is your answer please read entirely. Please rate this after reading it. This is important to me getting credit for my work. I have been in the antique business for over 45 years, Appraising, Antique shop owner, also buying and selling on today's current market. 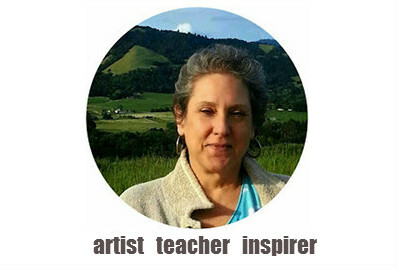 it is my pleasure to put my experience to work for you. 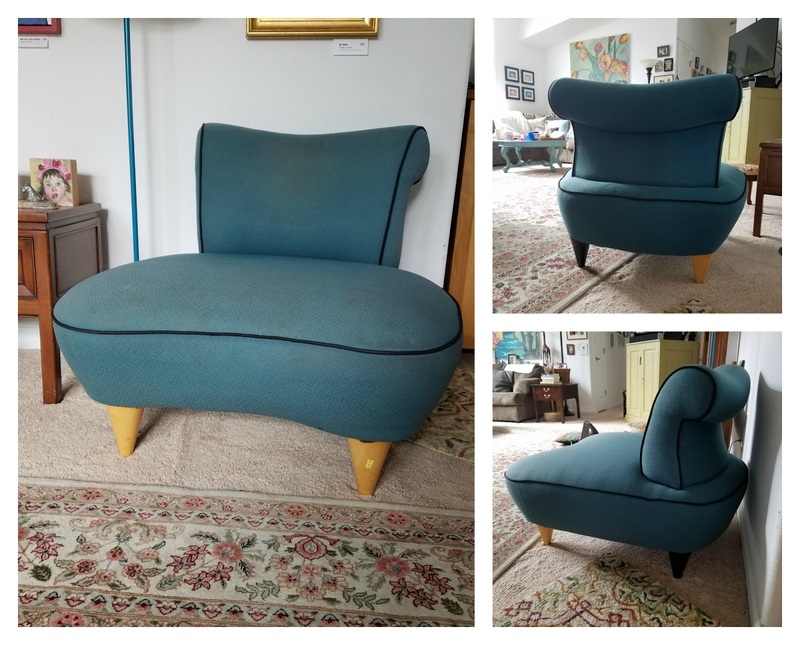 The Mid Century Modern Kidney Chair, has an estimated value on the current market for an average of $1050.00-1100.00depending on the condition and where it is for sale at. These will typically sell higher in an Antique Shop or Private sale compared to an auction. If you are thinking of selling, you might want to check your local Antique Shops in the area to see what yours or one like it would sell for or has sold for, then you can decide to sell online or locally.